It’s hard to imagine today, given the proliferation of scandalous news stories, that one could grab the attention of the world. Okay, that’s not true, it seems to happen weekly. But, in 1994, that wasn’t the case because the Internet as we know it didn’t exist. You watched the news — on a television. And one story did grab the attention of the world: the attack on figure skater Nancy Kerrigan that was allegedly instigated by fellow skater Tonya Harding. And with the release of I, Tonya, the real story of what happened will finally be told. Okay, not really. But, there are versions of the truth, as told by Harding (Margot Robbie), her then-husband Jeff Gillooly (Sebastian Stan), mother LaVona Golden (Allison Janney), and even her then-coach Diane Rawlinson (Julianne Nicholson). It’s all well and good, with the story beginning when Harding is three years old and eager to skate professionally, leading up to the day Kerrigan was attacked and the aftermath that would change Harding’s life forever. I, Tonya doesn’t make Harding a victim or villain. In fact, everyone is a villain in the film, for one reason or another. And there’s especially no forgiveness given to Harding for her trashy, redneck upbringing (of which she admits is true). That’s actually the backbone of the story as it dictates much of the hardships she endured in her personal life and in the professional skating world. For brief moments you feel empathetic, thinking that if she hadn’t been abused by her mother and husband, had a stable family life and more money in the bank for proper skating costumes, and an actual education, everything could have been different. The film makes sure to milk all that could be seen as trashy to the point of being obnoxious. You don’t need to be reminded that how Harding looks is a problem with the judges. It leaves one to question whether there just wasn’t anything else interesting to pad the first two acts of the film with, so screenwriter Steven Rogers just found new ways to repeat the same material. And then there’s the fourth wall breaking, which is unfortunate because it disrupts the narrative to such a large degree that the momentum of the film is lost repeatedly, as is depth of character because each performance is interrupted for the sake of explanation. What’s good about I, Tonya? The third act. The entire tone of the film changes and suddenly you don’t want to turn away for a moment. This is also when you find out the dirty details about the attack on Kerrigan and when each character really gets their moment to shine. It works to the film’s benefit because viewers will forget what came before and remember the moving ending to a terribly sad story. You won’t pity Harding at the end, but your eyes will be open to a different version of her story. 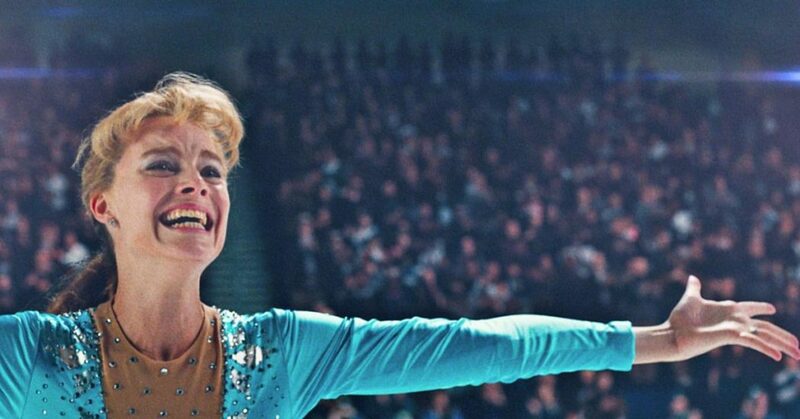 If you ever need an example of a film where the acting is top-notch but the movie overall not so much, I, Tonya is it. Robbie does an excellent job of portraying Harding as insecure and vulnerable, while also determined and full of a fire that’s fueled by misfortune. When the narrative moves to the 1994 Olympic Games, there is a scene of Harding alone before taking to the rink, having a breakdown of sorts as she prepares her makeup. It is one of the rawest performances you may ever see in modern day cinema. You could watch it on its own and know exactly the emotional toil occurring inside the character. Robbie may have the lead as Harding, but the supporting cast is incredibly strong, too. Janney plays a stereotypical trashy mom to perfection, chain-smoking and abusing her way through lines that make you recoil because of the contempt behind them. And then she’ll say something that appears to be of a caring nature, which throws you off completely because you actually believe she does care for her daughter. It’s perplexing and very engaging. The true underdog in the film, though, is Paul Walter Hauser as Shawn, Harding’s former bodyguard. If you want to pick a villain, he’s your man. Just try to not have your skin crawl when he’s explaining his part in the attack. It’s a performance that should not be forgotten — he does delusional sociopath extremely well. I, Tonya is not a perfect film. Nor is it a great film. It has performances in it, though, that help you forget its flaws to make it memorable.